As in past years, diagnostic assistance for forest and shade trees and other woody ornamentals will be available from our insect and disease clinic, along with our Conditions Reports. Presently our ability to support disease diagnosis is limited as the forest pathologist position has not been filled. The process of hiring a new pathologist is under way, but how long the vacancy will remain is still very much up in the air. Cooperative extension pathologist Dave Lambert has agreed to assist with diagnosis. We can do some triage, but may ultimately refer you to Dave. We ask you to be vigilant and to report to us any observations on tree insects and diseases of concern to you. We appreciate your willingness, expertise and commitment to help keep our trees and forests healthy, and look forward to working with you this season. Our business hours for 2016 will be 7:30 a.m. to 4:00 p.m. Monday through Friday, except for holidays. However, due to a very busy field schedule, we may not be able to staff the Insect and Disease Lab at all times. If you call our Lab and receive no answer, please call back another time. And if you plan to visit the Lab, you may wish to call ahead just to make sure someone will be present to meet with you. If you have questions on insect and disease pests of trees, you can submit a clinic form directly on-line at http://maine.gov/dacf/mfs/forest_health/tree_ailment.html. We will also accept samples mailed in to our Lab in Augusta. Our street address and location remains the same (50 Hospital Street, Augusta); our mailing address is 168 State House Station, Augusta, 04333-0168. Lastly, we have attached the following items to this report for your use: Advice and Technical Assistance Sheet; Insect & Disease Diagnostic and Report Form. Forest Pathologist Dr. William Ostrofsky retired at the end of October 2015. He began work as the forest pathologist for the Maine Forest Service in September 2006, bringing with him detailed knowledge of and a wealth of experience in the subject. Even while the cold of winter kept inquiries regarding fungal pathogens to a minimum, his presence was missed. Amy Ouellette joined us in September 2015 as a Conservation Aide out of the lab in Augusta. Among other projects, she has helped out in counting samples from the spruce budworm survey; surveying for winter moths and browntail webs, conducting equipment inventories and working on maintenance of the insect collection. Amy has insect survey experience from previous contract work with the Department of Agriculture Conservation & Forestry and diverse fieldwork experiences from previous employment. We’re happy to have her assistance in the division. Browntail Moth (Euproctis chrysorrhoea) – Unfortunately this year is going to be a banner year for browntail moth. Populations have increased over last year’s numbers and spread further afield. Winter webs of browntail moth glisten in the sun this time of year. Look for them in southern Maine at the tips of host branches including oaks, apples, birches, cherries, hawthorns, roses and other hardwoods. The caterpillars will be starting to come out of their webs on warm days looking for expanding buds. Exposure to caterpillar hairs, even those from the previous year, can cause dermatitis and other health problems in sensitive individuals. Browntail moth larva feed on the new foliage in the spring and can cause branch dieback and sometimes tree mortality after repeated years of defoliation. Winter web counts were again highest in parts of Bowdoinham, Bath, Topsham, West Bath, Woolwich (Sagadahoc County) Brunswick, Freeport and Harpswell (Cumberland County) this year. The infestation is expanding south into Yarmouth and Cumberland (Cumberland County) and east into Wiscasset, Edgecomb and Boothbay (Lincoln County) and beyond. We have seen pockets of infestation, some of them heavy, in other locations from Turner (Androscoggin County) to Waterville (Kennebec County) to Bristol (Lincoln County) to Kittery (York County). These spot infestations take less staff time, but if they are in your backyard they are noteworthy. A map of known risk of browntail moth exposure is available online. Note that this map reflects an average of reported or detected town-level risk and may not reflect conditions in your backyard. Small infestations can often be managed by clipping webs. Clip and destroy webs before the end of April (this is a fine winter activity when the woodstove is humming and the caterpillars are huddled in their webs, but a bucket of soapy water also works well). Pesticides are necessary to manage larger infestations. We have a list of licensed pesticide applicators that treat browntail moth and other pests of trees and shrubs available on-line or by request. Eastern Tent Caterpillar (Malacosoma americanum) – Watch for the developing tents of these hairy caterpillars in cherries and apples in late-April and early-May in southern Maine (later as you move farther north). In Maine this is a pest of significance in orchards and backyard fruit trees and, from an aesthetic perspective, on ornamental trees. It does not significantly impact forest health. You can look for and destroy egg masses of this caterpillar. But also monitor valued ornamental and fruit trees for developing tents and consider removing them when they are small. Emerald Ash Borer (Agrilus planipennis) – Emerald ash borer (EAB) has not yet been found in Maine. Purple trap surveys, biosurveillance sampling, trap tree processing and public reports have all yielded negative results in Maine. EAB has been found nearby in Massachusetts and New Hampshire. Even though this destructive insect has been found on our doorstep, it is still too early to be treating specimen ash with pesticides to protect from this pest. Experts recommend holding off treatment until the EAB is within 10-15 miles of the trees in question. In the meantime, resources are better spent on inventorying ash and survey and monitoring for the pest. Ash phenology gives us a great opportunity to conduct surveys as hardwood leaves emerge. Ash are among the last to leaf out (black locust is another slow-poke), and because of this characteristic are easily recognized after other hardwood leaves have flushed. An ash inventory can be as simple as a windshield survey to determine whether you have boatloads of ash to worry about or just a few. For more in-depth inventories, consider recording location, size, value and likely management approach for each tree. If you are going to remove an ash when it gets infested, you might want to consider pro-active removal, especially for large trees which will produce huge broods of beetles. Check out the nhbugs.org site on EAB, for some succinct advice on preparing for this pest in areas more than 10 miles from known infestations. Visual surveys can be conducted this time of year. 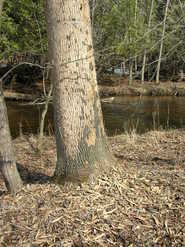 Symptoms to look for include increased woodpecker activity, bark splits and excessive shoots. 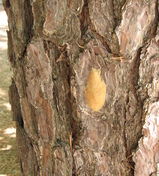 Signs such as larval tunneling, larvae or pupae may also be found in infested trees. After leaf out be on the lookout for crown thinning as well. Adult beetle activity is not generally expected until early to mid-June, in southern Maine. Later this year, consider participating in our trap tree network or conducting biosurveillance in your town. Gypsy Moth (Lymantria dispar) – Significant defoliation by gypsy moth hit southern New England in 2015. Maine was out of the bulls-eye, but this is a pest worth watching. Now is a good time to search for egg masses of gypsy moth around prized landscape trees and shrubs. Masses you find can be scraped into a bucket of soapy water. When pin cherries are in bloom, the caterpillars will be hatching. In southern Maine we should see them begin to hatch within the next couple weeks. Look for them soon if you intend to destroy them. If you find gypsy moth egg masses (or larvae later in the spring) in the northern ends of Oxford, Franklin, Somerset, Piscataquis or Aroostook County, please report your find, including the location and photos if possible to our office. An expansion of the quarantine area for this pest is planned—it takes a fair amount of resources to make the change, so we’d like to have the best possible picture of where the pest is established. Hemlock Woolly Adelgid (Adelges tsugae) – Hemlock woolly adelgid (HWA) has been found in forests along the coast from Kittery to Camden. 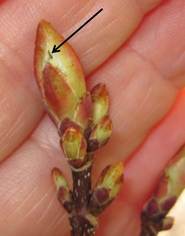 Infested ornamental trees have been found and treated farther afield. We have entered the time of year when hemlock woolly adelgid can be spread on items other than live hemlocks. Eggs and crawlers are out and can be transferred to hemlocks in new areas. If you are working in both infested and uninfested areas, try to begin your day in uninfested sites, and end in infested sites. To avoid spreading this pest to new locations, clean clothing and equipment before moving from infested areas to uninfested areas. Hemlock branch material from quarantined areas is regulated. Chipped material must stay inside the quarantine or be moved in an enclosed vehicle to a facility with a permit to receive regulated hemlock. Roundwood can be shipped freely outside of the quarantine area, but must be free from branches. HWA winter mortality assessments were conducted in early March this year for a project in cooperation with Tom McAvoy at Virginia Tech. Mortality ranged from 91% to 99% across five sites, and averaged 96%. This is up from 2014-2015 when the range was from 83% to 98% and the average was 93%. This may come as a surprise, as this winter was mild in comparison to last. However the timing of extreme warm and cold in early February may have played an important role in increasing mortality of this pest. The good news is, infested trees should experience a reprieve from heavy attack, and spread of this insect should be slowed. Unfortunately, populations of adelgid building from this winter’s survivors may be more tolerant to winter cold than previous generations. Spring treatments may not be necessary for trees that are being treated with non-systemic materials. Adelgid wool can be persistent, be sure to check for live adelgid before conducting foliar applications. If you run your finger down a twig with live adelgid, it will be stained red from their hemolymph. Hemolymph of dead adelgids quickly turns brown, and then dries. Springtails (Collembola) – Springtails are small, soft-bodied primitive insects. In most situations, they are not pest species. Springtails thrive in moist places and generally feed on decaying plant matter, fungi, bacteria and other organic matter. They are abundant; one estimate is that a cubic meter of soil holds about 100,000 springtails. Most are seldom seen by casual observers, snowfleas are an exception. They frequently aggregate in impressive swarms during winter and spring thaws and other ideal (read “moist”) conditions. Swarms are short lived and usually don't last more than a few days. Captivating macro-footage of springtails can be found on-line at: https://vimeo.com/147126953. This winter we received many reports of masses of springtails—some in shovel-able quantities. Unfortunately, several reports came in a “shoot first, ask questions later” fashion—chemicals had already been applied to the “offending” swarm before identification of the organism. A keystone of pest management is to identify the organism to be managed—what you’re looking at might not be a pest at all! As for springtails, management outside the immediate home environment really is not necessary. However, keeping areas around building foundations and entrances free of rotting debris including decaying mulch and leaves and reducing moisture around the building can limit swarming around the home and prevent infiltration into the home. If they do make it inside, snowfleas or springtails are not likely to survive long in a dry indoor environment. Persistent populations of springtails within homes should be addressed with moisture control, not chemical control. Spruce Budworm (Choristoneura fumiferana) – The final draft of an initial spruce budworm risk assessment and response plan for Maine was released in March by the Spruce Budworm Task Force. The report is available on-line at www.sprucebudwormmaine.org. Some key recommendations for forest landowners and managers, along with commentary, are included below—more details are available in the full report. Participate in monitoring efforts such as moth trapping. > A cooperative trapping effort involving more than 20 land owners and managers was instituted following the formation of the task force in 2013. This system has worked very well and has expanded the trap network considerably. A report on the 2015 spruce budworm program, including the cooperative monitoring project can be found online. Participants in the 2014 and 2015 trapping network continue to be committed to the program. Their contribution is greatly appreciated. > Maine joined the Healthy Forest Partnership Budworm Tracker Program in 2016. Volunteers will trap and collect spruce budworm moths one or more times a week during the moth flight season, and send the data and moths back to the research team. The response to the request for Maine volunteers was terrific! At this point they are near or at capacity for our area. Regularly communicate to understand how the infestation is moving. > A new avenue for communication is available. In addition to information available in these bulletins and other division publications, updates will be posted on the Spruce Budworm Task Force website and their Facebook page. Map location, condition, and concentration of high-risk stands on forestlands. Adapt harvest activities before or as early as possible into the outbreak to reduce the area of high-risk stands. >Landowners have been encouraged to harvest stands with a significant component of merchantable fir and white spruce before the outbreak builds. A challenge to this approach in recent months has been dwindling markets. However, the recommendation remains to continue to try to reduce risk across the landscape where markets are available. Prepare for the possibility of applying insecticide to protect foliage in high-risk and high-value stands not ready for harvest. >People have already begun to ask what this might look like in Maine in the coming outbreak. The most succinct response is true for the coming budworm outbreak as a whole—it will be different from the last outbreak! Changes include: effective, targeted insecticides that were not fully developed at the time of the last outbreak are now available; new application technologies allow more intricate spray blocks to be delineated and treated; there will not be a state-run spray program. Prepare to salvage dead and dying trees when they occur. White Pine Weevil (Pissodes strobi) - Host trees of the white pine weevil include, as one might guess, white pine, but the beetle also has a taste for other pines and spruces. Often the calls we get from homeowners are regarding favorite blue spruces damaged by the beetle. Larval feeding can kill the host’s leader (terminal shoot), causing loss of apical dominance, and can lead to development of a shrubby tree. In southern Maine temperatures are already high enough to trigger emergence of white pine weevil adults from their winter homes in the duff beneath their host trees. The adults climb up the host trunks and feed on the terminal shoots. Soon after, females will deposit eggs in the terminal shoots. Eggs hatch within a couple weeks and the larvae chew their way downward, cutting off the conductive tissue of the shoot and causing the shoot to wither and die. Host leaders can be protected from attack by physical barriers and pesticides. A protective sleeve made from a nylon stocking and a twist tie is an easy, low-tech approach to preventing attack in small ornamental trees. Fasten the stocking before temperatures climb above 60 degrees Fahrenheit in the spring, and remove it before shoot elongation. See the early season guide for information regarding chemical controls. Winter Moth (Operophtera brumata) –The tiny caterpillars of winter moth are starting to hatch and mine the buds of hardwood trees. The easiest way to track down the larvae at this stage is to inspect host buds for silk and specks of frass. Wait a few weeks, and the signature feeding damage will be evident on expanded host leaves. Like the cuts in a paper snowflake, the larval bites make holes through several layers of leaf tissue, giving the unfurled leaves a Swiss cheese appearance. Caterpillars will finish feeding by the end of May or early-June and drop to the soil to pupate. Surveys and reports of adult winter moths flying in December of 2015 indicate that winter moth numbers are up. Warm temperatures and no snow/ice cover allowed the moths to easily mate and lay eggs. Expect defoliation this year in places that have had winter moth in the past and extending into surrounding areas. Places with significant number of moths caught or reported were Eliot, Kittery, South Berwick, York (York County), Cape Elizabeth, Harpswell, Portland, South Portland (Cumberland County), Bath, Georgetown (Sagadahoc County), Boothbay Harbor (Lincoln), Friendship, Saint George , Thomaston, Vinalhaven (Knox County), and Mount Desert (Hancock County). A risk map for winter moth can be found on-line. Winter moth eggs that are exposed on trees can be killed with horticultural oil that suffocates the eggs. Oil should be applied in very late winter or very early spring when temperatures are above 45° F. Avoid applying oil when temperatures may dip below freezing for 24-48 hours after application. (Cold greatly increase the risk of causing injury to the plant (phytotoxicity).) Also cool and cloudy weather can delay drying time and increase the potential for injury. Eggs that are protectively hidden within crevices and under lichen will not be covered by the spray nor killed. Where there is heavy winter moth pressure the oil sprays will most likely only achieve limited results; eggs are deposited virtually everywhere on trees and shrubs and new caterpillars will quickly migrate from untreated areas to the oil-treated plants. Once the larvae hatch and leaves begin to expand in early May trees can be treated with the biological insecticide Bacillus thuringiensis (kurstaki) (B.t.k). B.t.k. works best on young larvae; older ones are much less affected. For older larvae use a spinosad product. As a last resort a conventional insecticide such as a permethrin is effective against winter moth larvae. The biological control tachinid fly, Cyzenis albicans, has been released in Kittery, Vinalhaven, Harpswell, Cape Elizabeth and Portland (Peaks Island) since 2013. We hope some of the winter moth larvae will eat parasitic fly eggs. For those unlucky ones, the fly will develop within the winter moth cocoon, and prevent the winter moth from developing to adulthood. We will continue to release parasites where winter moth populations are high enough to support the control agent. Needle Diseases of Hard Pines – Early spring is the appropriate time to use fungicides to manage several pathogens. Sphaeropsis (= Diplodia) tip blight of red, Austrian, and Scots pine, and Sirococcus shoot blight (Sirococcus conigenus) of native and exotic species of hard pines are perennial problems. Protection of the new, current-season growth with fungicides can provide effective control. Specifics for several of the most important diseases are listed in the Early Season Guide to Pest Management in Maine. The new growth (foliage, needles, and shoots) needs to be treated with the appropriate fungicide before infection occurs. This usually requires an application shortly after budbreak, and again ten days to two weeks later, to protect the new growth as tissues expand. Timing of the first application varies from year to year, depending on local seasonal temperatures. Weekly observations of buds from late April through May will allow tailoring fungicide application timing to maximize effectiveness. Spruce Needlecast – Wet spring seasons also provide ideal conditions for the intensification of Rhizosphaera needlecast infection on spruce, especially in landscape situations. The fungal pathogen (Rhizosphaera kalkhoffii) causes most significant damage to white and Colorado blue spruces, but other spruce species may be affected. Most frequently affected are border plantings of larger spruce, where trees provide a screen between abutting properties, but solitary trees may be affected as well. Symptoms typically develop from the bottom interior of the crown and slowly advance in an upward direction. Infected older needles turn a purplish-brown, and are shed first. Often, only the tips of the branches retain needles. For effective control, at least two applications of fungicide are required; at half-needle elongation of newly emerging shoots, and again when needles are fully elongated. Fungicides will protect only the new, current-season shoots and foliage, so annual treatments over two or three years may be required to fully restore a dense, full tree crown. White Pine Blister Rust (Cronartium ribicola) – Early spring is an ideal time to scout the woodlot for currants and gooseberries (plants in the genus Ribes), which serve as a host for the fungus which causes white pine blister rust. Ribes plants are some of the first vegetation to leaf out in early spring, thereby becoming easily located for removal or treatment. Ribes plants, the primary host of white pine blister rust, will be one of the first understory plants to leaf out, usually by mid-April in southern Maine. There are several native species common throughout Maine. Because foliage of most other forest vegetation has not yet emerged, early spring is an ideal time to scout for Ribes plants. Located plants can be treated now (physically removed or treated with herbicide), or “flagged” for treatment at a later date. Ribes spp. eradication from around white pine stands has been an effective control measure for this disease since the practice was first initiated in Maine around 1918. Removal of all Ribes species within 900 – 1000 feet of susceptible pines or pine stands will greatly reduce the likelihood of infection of white pine by the white pine blister rust pathogen. Some other New England states and New York have allowed the cultivation of Ribes specifically bred to be resistant or immune to the disease. However, a more virulent strain of the pathogen was discovered in 2011 in New England, and cultivars of Ribes once resistant or immune are now susceptible, and pose a significant risk of spreading the disease to white pines. The importation, possession, planting, and culture of currants, gooseberries, Jostaberries, Worcesterberries and all other species of Ribes is prohibited by law in the quarantine area of Maine. In addition, the importation, possession, planting, and culture of any Ribes nigrum (European black currant) or its varieties or cultivars is prohibited throughout the entire state. Spring is here, so it’s time to think about the outdoors and proper protection against ticks. Maine had 1,171 cases of Lyme disease reported in 2015. May is Lyme Disease Awareness Month and we want to remind you the importance of daily tick checks and encourage the “tick watch” prevention strategy. Ticks are primarily active in warmer months. Lyme disease is a bacterial infection that is caused by a bite from an infected deer tick (Ixodes scapularis). In Maine, Lyme disease is most common in adults 65 and over and children between the ages of 5 and 15, but anyone can get the disease. Individuals who work or play outside are more likely to be exposed to ticks. The most common and visible symptom of Lyme disease is a red bulls-eye rash that grows and appears within 3-30 days of exposure. Other symptoms may include fevers, and joint or muscle pain. Lyme disease is treatable and most individuals recover completely with a proper drugs. Deer ticks can transmit not only Lyme disease, but also two other tick-borne infections that are present in Maine: anaplasmosis and babesiosis. Babesiosis cases increased in 2015 and cases of Anaplasmosis remained steady. The majority of tick-borne illnesses occur during the summer months when ticks and humans are active outdoors. Lyme disease data through the Maine Tracking Network. University of Maine Cooperative Extension Tick ID Lab submission instructions. To get Lyme updates throughout May please like the Maine CDC Facebook page. See also, Maine IPM Council's A Homeowner's Guide to Managing Ticks. Tree Pest Information Session. Wednesday, May 11th, Surry, ME, 7-9 pm. Surry Garden Club. Rural Hall. Presented by Allison Kanoti, Maine Forest Service. FMI Contact the Surry Garden Club. Spruce Budworm Forum. Wednesday, May 25th, Lee ME, 5-7pm. Join Lee Academy Teacher Susan Linscott and her students for a forum on spruce budworm. Speakers will include Allison Kanoti, Forest Entomologist and Terri Coolong, District Forester from the Maine Department of Agriculture, Conservation and Forestry’s Maine Forest Service.